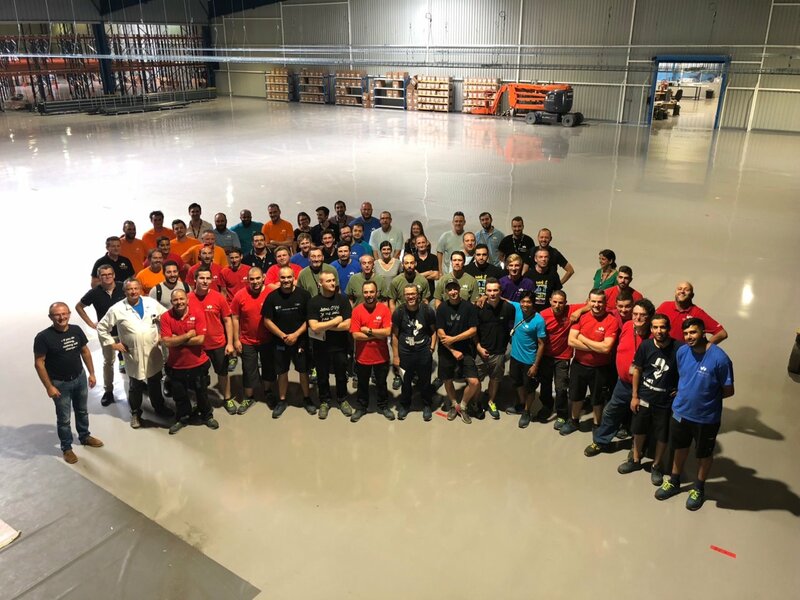 2018 marks an important year for OVH with the opening of a brand new site for the Manufacturing and Logistics teams in Croix, near the Roubaix headquarters in northern France. It is a showcase for the group's know-how, innovation and mindset, says Guillaume Hochart, Project Manager. Modernising the entire production chain is one of his missions. Why this project to create a new site for the Manufacturing and Logistics teams? G. H. Given OVH's hyper-growth, we needed to have a new production site for Europe in addition to our site in Beauharnois, Canada and the project to open a production line in the United States. By doing this, we will increase our current annual production capacity from 120,000 to 400,000 servers. But we wanted to do more than just open a new unit. We wanted to take advantage of this opportunity to make it a world-class factory based on lean management concepts. Lean management is an approach I have applied with success for many years now. It has proved its worth in many sectors, including extremely demanding ones such as the nuclear industry. I have gained strong expertise in lean management during my 15 years in the industrial sector, working in everything from gas valves to nuclear power. I know how valuable it can be. I wasn't a computer specialist, but I did click with the mindset that Octave Klaba has been able to instil in OVH. Everything here is super smart and a catalyst for ideas, which is very conducive to lean. This approach makes it possible to combine improving the company's performance, particularly around the concept of "just-in-time", with involving employees in the improvement and design of their workplace environment. That's the thinking behind this project to open the Croix site. What does “world-class factory" mean to you? G. H. The Roubaix site was practical and efficient. It has stayed pretty efficient as it has evolved in line with the company’s growth. But we need to increase our production capacity as well as take advantage of the latest technologies and production methods. For example, until now we haven't done much to ensure that our customers see the value of our assembly line. Today, we need to be able to show them what we are capable of. So we have designed the Croix site to be a real industrial showcase for our partners and customers. The idea is to give them confidence in our supply chain and industrial organisation so that they have no doubt that they’re with the right partner. The Croix site will make it possible to demonstrate, at any given moment, that controlling our industrial processes represents a competitive advantage in terms of quality, cost, lead time and flexibility. G. H. Productivity gains and growth in agility must first and foremost serve human beings. For example, coating the floor with resin to prevent vibration and allow the parts to be transported by robots leads to benefits for employees. They will have fewer tedious tasks to perform and will be able to concentrate on tasks with higher added value, while at the same time enjoying a better working environment. That's also what Industry 4.0 is all about! In fact, we really want the Manufacturing and Logistics teams to be able to fully express their ingenuity and creativity. Thanks to the availability of digital data, advanced robotics and automation, employees will be able to develop their skills in proactivity, rapid decision-making and real-time adjustments. Management has been made more visual so that any anomalies are clear at a glance and employees can take the appropriate measures as quickly as possible. And is this another area in which lean management plays a major role? G. H. From the perspective of lean management, every aspect of the environment is important. In particular, it involves reducing lead times, i.e. controlling ongoing production, stock levels and how quickly operations take place. We have also worked on preparations for the production line so that the various components are available and ready to be assembled at the right time, like in the automotive sector. With more than a hundred possible combinations of its servers, OVH really needs agility and flexibility to allow the servers to be customised. This is the goal of the One Piece Flow concept that we have also implemented. We really need maximum efficiency between the moment the components arrive and the moment the final product is ready. This just-in-time flow makes it possible to produce 95% of servers in less than four days. How will the spaces be organised? G. H. The new site covers 14,000 square metres, so it should be possible to integrate the hundred or so people from the Manufacturing and Logistics operational teams, as well as their production units. Under the principles of lean management, we wanted to optimise the available space so that we have the capacity to develop in the future as well as welcome certain service providers. OVH has chosen to focus on its core business, the integration of technical and IT elements. The manufacturing of certain components, in particular those that require lasers, welding and metalworking, is outsourced to trusted service providers. They will work in the building to improve lead times as well as boost flexibility between our labs and our prototypes. Will there also be labs on the site? G. H. Innovation has to be continuous. The Croix site will make it possible to streamline our teams, spaces and conditions to speed up our innovation and improve our product development process. Five labs are planned: the hardware lab, dedicated to the performance of components and the assembled server; the software lab for checking integration in the computer system and software updates throughout the server park; the cooling lab, dedicated to operating servers in extreme temperatures; the mini datacentre lab to test the various mechanical, thermal and structural solutions; and the industrialisation lab, in which we plan to focus on the development of new products and which will be open to shared innovation projects. Why did you choose Croix for the site? G. H. The choice of a town located just a few kilometres from the Roubaix datacentres is of course strategic, to optimise supplies. It also means employees don't have to make many changes to their lifestyle or routines. The site is well served by public transport. The industrial building is like a cathedral – the kind of size we're looking for and with high ceilings, straight walls and smooth floors. The light has also been upgraded to reach 500 lux and create a high-quality environment for us to work in. Finally, all the energy capacity we need is already there thanks to the site's previous use. G. H. The site is intended to become the headquarters of OVH's Industry activity. It will be divided into two parts: logistics and production. I would also like to praise all the teams. They have been fully open to change, have shown great agility and have done their best to ensure that everything is ready on time. Just to clarify, until the end of the move, scheduled for September, the Roubaix site remains fully operational to handle all orders.